We took a big family vacation to Breckenridge, CO, in June and of course we couldn�t help but enjoy all that Colorado has to offer (even though my physical therapists probably wanted me to dial it down a bit). On one of the days we did a hike up to the top of Quandary Peak, which is a mere 14,265 feet above sea level. 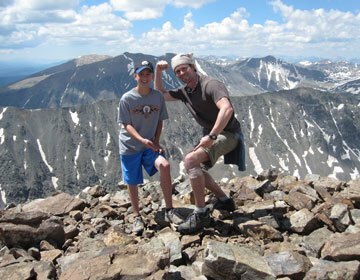 Before making our climb, Kyle and I made a pact that if we made it to the top we�d take a picture together at the top pointing to our recent surgically repaired knees and send you a photo. The photo barely does justice to the panoramic view we had up there, but I hope you like it. We couldn�t have done it without your expertise and all the care and attention we received after the surgery. I look forward to my follow-up visit tomorrow and hope you�re pleased with the progress! Thanks for everything you�ve done for both Kyle and me!